Ceylon Cinnamon sticks are soft, crumbly and rolled like cigar with layers of soft brittle Cinnamon bark. All other Cinnamon looks like the Cassia Cinnamon sticks and tends to be hard, hollow and have only one rolled or curled layer. Notice the color difference. Ceylon Cinnamon is lighter in color while other Cinnamon tends to be darker in color. 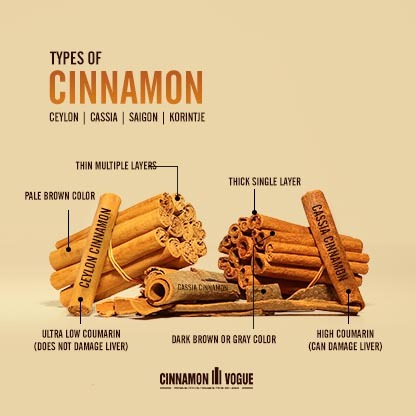 We take a look at the four main types of Cinnamon, Ceylon, Cassia, Saigon, Korintje Cinnamon and identify them by color, taste, aroma and appearance. There are hundreds of types of Cinnamon. But only 4 types or varieties of Cinnamon are used for commercial purposes. With the exception of Ceylon Cinnamon, Cassia, Saigon and Korintje Cinnamon are also classified under the Cassia Cinnamon category because they are very similar to each other with only slight variations in color, taste, shape and Coumarin content. All Cassia type Cinnamon are hard and have high levels of Coumarin a substance known to cause liver damage, while Ceylon Cinnamon is the only soft and brittle Cinnamon with ultra low Coumarin levels. Most of Europe used Ceylon Cinnamon primarily because this was the first spice European explorers (Portuguese, Dutch and British) brought back from their conquests of Ceylon (Sri Lanka) nearly 400 years ago. But cheaper Cassia has made inroads and has come to dominate the market. Coumarin is a substance that can cause liver damage or complete failure. Only Ceylon Cinnamon has low levels of Coumarin, while all other varieties of Cinnamon have high levels of Coumarin. At one stage the German government banned Cassia type Cinnamon. But take a closer look at this university of Mississippi study which shows the high levels of Coumarin in all other types of Cinnamon, except Ceylon Cinnamon. If you are taking Cinnamon for health reasons, then you must and should switch to Ceylon Cinnamon. The European Food Safety Authority (EFSA) established a tolerable daily intake (TDI) of 0.1 mg/kg body weight of Coumarin in Cinnamon. 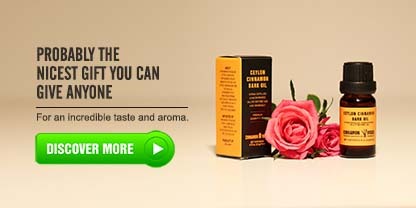 Read more about Coumarin in Cinnamon here. Around 70% of North America uses Cassia Cinnamon. Indonesia is the chief supplier of Cassia Cinnamon. This is because it is much cheaper than Ceylon Cinnamon which tends to be expensive because of the hand crafted process needed to harvest it and roll it in multiple thin layers. Cassia Cinnamon is a hard bark that is spicy, smells pretty strong and sometimes bitter. This is another Cinnamon which has gained in popularity recently. Originating in Vietnam this cinnamon admittedly makes a good first impression in terms of sheer aroma and taste. It tends to be even more spicy and strong and sweet at the same time. It's a little more expensive than Cassia Cinnamon but has the highest levels of Coumarin. The quality of Chinese cinnamon is not great. While part of the Cassia Cinnamon family it tends to be more pungent, less sweet and slightly bitter. Possibly because of the soil conditions. Cinnamon quality can vary depending on soil conditions. Most Chinese Cinnamon probably stays in China, used in many of the Chinese medications for coughs, phlegm and other illnesses. Ceylon Cinnamon grows best in sandy soil. The tree grows to about 49 feet in its natural state but is cut earlier for commercial purposes. It has a thin bark. The leaves are shiny and leathery on top and dull on the underside. The flowers are white with an oval sized fruit which becomes bluish with white spots when ripe. The leaves when crushed are spicy and hot to taste while peeling away the outer bark of the tree yields a very strong cinnamon smell. The biggest advantage of Ceylon Cinnamon (also known as Mexican Cinnamon) is ultra-low Coumarin levels. Coumarin in high doses causes liver failure, so for people who take Cinnamon on a daily basis, Ceylon Cinnamon is the preferred choice. For fine desserts Ceylon Cinnamon is an absolute must because it is subtle, smells very mild and is slightly sweeter in taste. It never takes center stage in the recipe but adds a very complex flavor. Although Ceylon Cinnamon smells mild, if you grind and add it to baked goods or Cinnamon French toast for example, the aroma it gives off is a very sophisticated and fragrant. Most well established recipes that call for Cinnamon came from Europe or the middle east and should use Ceylon Cinnamon. The same applies to any Mexican recipes that calls for Cinnamon. This is because the taste profile of these desserts were designed with Ceylon Cinnamon. Mexico is the biggest importer of Ceylon Cinnamon. However because the supply in the US is overwhelmingly Cassia Cinnamon, most people have been using Cassia Cinnamon. That makes the desserts taste very different. Even many Mexican desserts made in the US erroneously substitute Cassia Cinnamon, which ruins the original taste profile of the dessert. Because Ceylon Cinnamon tends to be mild and sweet, it lends itself to creating sophisticated layers of flavors that is not possible with the harsher Cassia Cinnamon. 32 - 49 ft. 22 ft.